Astronomers tend to assume that the timing of Earth-striking meteors are completely random, but a recent analysis suggests that meteor impacts are more likely to occur at certain times of the year and at certain locations. Such is the conclusion of researchers Carlos and Raul de la Fuente Marcos of the Complutense University of Madrid. Their new (and yet to be published) paper shows that the frequency of impacts are higher at certain times of the year — times when Earth's orbit takes us through streams of meteoroids. The ensuing seasonality and lack of randomness is caused by planetary perturbations, especially Jupiter's. 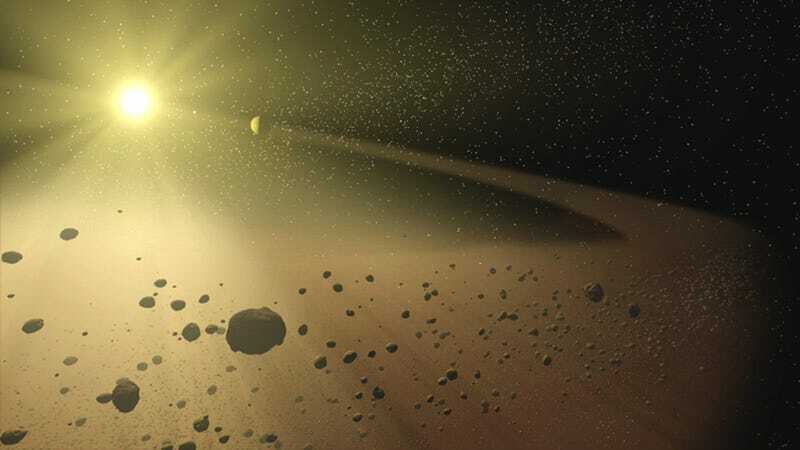 And in fact, this study suggests that some recent Earth impacts may be linked with resonant groups of Near Earth Objects (NEOs) and possibly very young meteoroid streams (which are generated by the break-up of an asteroid or comet). Asteroids and meteors are sometimes herded by planets or moons into loose orbits called "resonant streams." Every so often they're broken up by large planets. To reach their conclusion, the investigators studied 33 multi-kiloton impact events from 2000 to 2013 that were detected by infrasound acoustic pressure sensors operated by the Comprehensive Nuclear-Test Ban Treaty Organization. They found 17 impacts occurred in the northern hemisphere and 16 in the south; 25 impacts occurred within 40 degrees north or south of the equator, while only eight occurred at higher latitudes. Significantly, the authors found a 21 per cent difference in meteor timing, with 20 impacts across the second half of the year compared to just 13 hits in the first six calendar months. For people in the southern hemisphere, June was the most likely month for a meteor to hit the Earth, while September and October were the least likely. Overall though, more meteor impacts were recorded in the second half of the year — 12 compared to four in the first six months. North of the equator, November was the most likely month for a meteor hit while May and June were the least likely. Distribution was pretty even throughout the year with nine meteors occurring in the first half of the year and eight in the second half. However, the authors believe the timing will change as old meteoroid streams dissipate and new ones form. And as the researchers conclude in their study, "An intriguing consequence of this scenario is that the impact hazard of Chelyabinsk-like objects should peak at certain times in the year." An interesting study, for sure. But the 33 sample events are definitely not enough. This is one hypothesis that clearly needs more data. Read the study at the pre-print archive, arXiv: "Recent multi-kiloton impact events: are they truly random?" And check out the entire article at ABC/AU.